If there is such a thing as an underdog in comics 'The Mighty Crusaders' might be one. 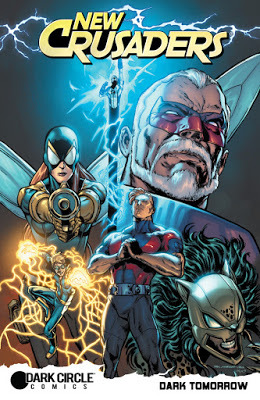 A superhero team created by Archie's adventure imprint during the Silver Age it became lost in the shadow of Marvel's Avengers and DC Comics' Justice League of America leading to a short shelf life. In fact, several attempts to revive the series, even one under DC Comics, resulted in single-digit runs. Archie is trying once again through it's Dark Circle Comics imprint to spark a meaningful resurgence with a 'New Crusaders: Dark Tomorrow' one-shot. The books opens with a two-page recap to help readers catch-up with the story from two previous editions. It's concise and provides a great prelude into the issue that is mostly action-packed. The original Mighty Crusaders fell to the supervillain, the Brain Emperor, with only The Shield surviving. The team left behind their children and proteges. The Shield helped them understand their powers and get them geared up to become the New Crusaders. The team consists of Greg Dickering as The Comet, Alex Tyler as Fireball, Johnny Sterling as the new Steel Sterling, Kelly Brand took on her mother’s mantle as Fly Girl, Ivette Velez is The Jaguar and Wyatt Raymond donned a special suit to become The Web. Where the Silver Age 'Crusaders' were a campy group of heroes parodying the teams of the Big Two and the '80s DC Comics version was skewed toward younger readers, Dark Circle's 'New Crusaders' is more of a straight-forward super team with the same dynamics we've seen before in other young hero groups. Does it break new ground? No. Is it exceptional in any significant way? Not necessarily. What makes the team intriguing is that they share a common bond. They were born from tragedy and now rely on one another to get acclimated to their new powers and work as a team. There's great storytelling potential to watch them grow and galvanize as a force for good and get their revenge against the Brain Emperor. The issue provides a ton of action and fighting as they take on Ragnarok, a powerful Viking, looking to lay waste to the young heroes. Ian Flynn does a wonderful job of showing the camaraderie of the group and there's some chemistry there as well. Chemistry is one of the most difficult elements of a superteam book and 'New Crusaders' has a foundation of it. The epic fight with Ragnarok also exposes the team's inexperience and shortcomings. It's a realistic development considering how little time they've had to gel. This leaves a lot of room for growth and storytelling potential. Alitha Martinez's art is great with plenty of exciting layouts full of combat and powers. The scenes have a cinematic energy that serves the story well and keeps the action moving from page to page. 'New Crusaders' deserves a chance to blossom under the new Dark Circle Comics imprint where, more than anywhere else, can become a valuable addition to their line-up. It has a fertile foundation to build upon, with some diverse brave young heroes. 'Dark Tomorrow' proves that the 'New Crusaders' can be an exciting action series, that it can find redemption for its legacy and solidify itself as an on-going.